Whether your restaurant is quick-serve or dine-in, you’ve probably already incorporated icecream in some form on your dessert menu. While many turn to a traditional cone or sundae, many restaurants forget to tap into the potential of a gourmet ice cream dessert. From a simple hand-dipped cone to a premium ice cream treat, incorporating summer’s coldest dessert has never been easier. Accounting for a whopping 87% of frozen dessert sales, traditional ice cream is a must-have for your restaurant dessert menu. So what exactly makes soft serve different from hard ice cream? Aside from the obvious difference in texture, the preparation is altered as well (contributing to the difference in product). At the time of freezing, soft serve ice cream preparation introduces air, giving it the lighter, softer texture. 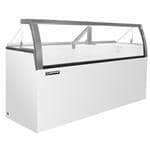 Be sure to take advantage of bulk discount prices by storing any hard ice cream in your Metalfrio Chest Freezer. Remember that most hard ice cream suppliers require storage at -20 degrees, and your standard walk-in usually ranges from 0 to -10, so investing in a chest freezer is essential for proper storage. Ice cream and custard are only differentiated in the commercial world by the addition of egg yolk for a smoother, thicker texture. Only 1.4% of egg yolk by weight legally needs to be added for a genuine custard, but many vendors add more than the legal requirement. Lecithin in the egg yolk is what gives custard their richer, creamier textures! If you choose to add more air to the mixture (also known as overrun), the resulting texture is more like a mousse and can be used in different gourmet desserts. Because of its susceptibility to defrosting due to its more sensitive makeup, custards are not able to be mass-produced and sold in grocers, making it a desired option at restaurants. As the second highest in sales for frozen desserts, claiming about 4% of sales, frozen yogurt is the conglomerate of an ice cream base with yogurt cultures. As a result, frozen yogurt reaps the flavor and texture benefits of both a sweet, cold ice cream and tangy, smooth yogurt! Also, because there is less fattiness than ice cream, frozen yogurt has less overrun (or added air), resulting in that distinguishing creamy texture. The added bonus of using live cultures is that they help promote a healthy digestive tract. The Spaceman Soft Serve Machines are perfect for creating custard, ice cream, AND frozen yogurt, making it an easy choice if you plan to serve any of these frozen desserts. When you can cut out the addition of extra pieces of equipment, you save money and space in your kitchen.